Two in my opinion very interesting and somewhat conflicting charts today. The first picks up on yesterday’s theme by showing the monthly interest rate of UK resident banks and building societies sterling standard variable rate mortgage to households (not seasonally adjusted) and highlights that for this data set rates remain at near record lows at 3.97% (actual low was 3.82% in April 2009). Compare this with CPI of 3.4% and RPI of 3.7% and my comments of yesterday. However if I was a buy to let investor or property owner I’d be getting nervous by eyeballing my second chart today. 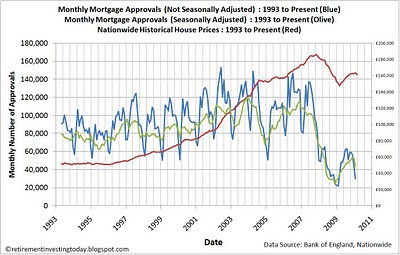 Even with these almost below inflation rates, mortgage approvals are heading downwards to 29,771 seasonally adjusted for January 2010 and 48,198 non-seasonally adjusted. These are falls of 30% and 17% respectively from December 2009. Falling mortgage approvals suggests less competition in the market for each house that is for sale. 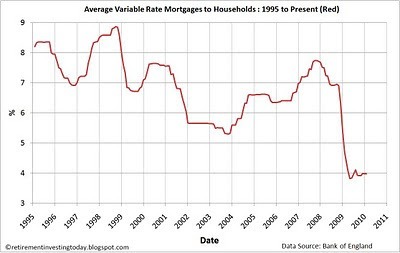 The red line shows historical house prices and the effect on prices the last time we saw big drops in mortgage approvals. This time however the Bank of England can’t do much more with the Official Bank Rate and really can’t (although I wouldn’t be surprised) be undertaking more quantitative easing (QE) with inflation at its current levels. Could the rules of supply and demand finally start to work in the near future? If the big drops in approvals are not due to the poor weather then what lies ahead? I’m still not going to call a ‘Return to “normal”’ phase for the UK house market but its’ certainly getting interesting.